A note in the Fairways program emphasizes that the musical is “not meant to be a serious work, just a whole lot of fun for the actors and audience.” The problem with that sentiment is that $32 is a serious price for ticket, especially for a brand new company in a competitive neighborhood. 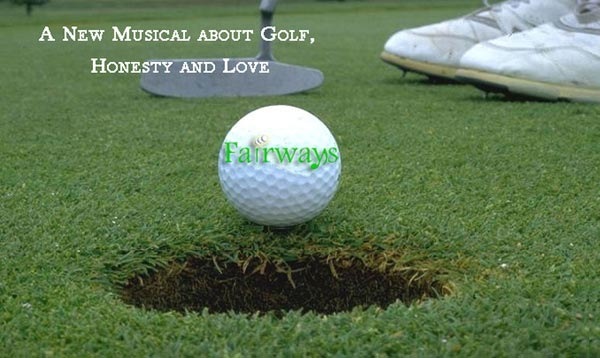 Despite the non-serious nature of the musical, there still needs to be some sort of emotional reality beneath the characters, and both the book and music of Fairways are obstacles for the actors in reaching that place of honesty. Now, I don’t play golf. I don’t have any emotional attachment to the sport, but my enjoyment of Fairways as a musical shouldn’t require me to be a golfer. If anything, it should make me want to pick up a club and hit the green myself, yet Reed’s predictable book and forgettable lyrics do nothing to make golf intriguing. The show begins in 15th century Scotland, where the local men are looking for a way to pass the time as they tend their crops and flocks. The opening number is cute and the actors are certainly enjoying themselves, but problems already begin to appear in the beginning moments, with some actors in Scottish dialect while others are in Irish. 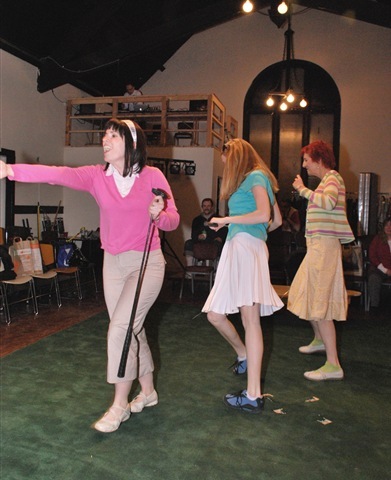 After the ensemble shares a pint, the action shifts to the present, where Betsy O’Neill (Jeanne T. Arrigo) is trying to teach her daughter Kathy (Erin Renée Baumrucker) to golf, in hopes that it may win her the Mother-Daughter Tournament and add some spark to her daughter’s love life. The relationship between the two women feels like a mother and her preteen daughter rather than two mature adults, and the jokes in Reed’s script are painfully cheesy. “Golf will be good for you, like yoga.” “That’s a stretch.” Groan. Fairways is Reed’s first stage work, and her dialogue never quite sounds like natural human speech, with the characters shirking away from any forms of subtlety or subtext and speaking as directly as possible. The result is that the dialogue becomes a tool to move the plot forward and not much else, giving little insight into the emotional life of these golfers. As Betsy instructs Kathy, Byron Mackay (Jay Cook) is teaching his son Sam (Jamie Watkins) the game so that he can impress his Boss (Michael Bragg). Sam is dating Joan Woods (Erin Lovelace), the daughter of Betsy’s rival Nancy (Regina Webster), and the mother-daughter duo is unanimously hated by the golf club. If the plot is beginning to sound a little busy, it is, and nothing really gets fleshed out to the point that it becomes believable. Betsy and Byron sing a duet about golf called “Do Nothing,” a song that praises “a game about life, a game about nothing at all.” That is the main flaw with Fairways: nothing has consequence. 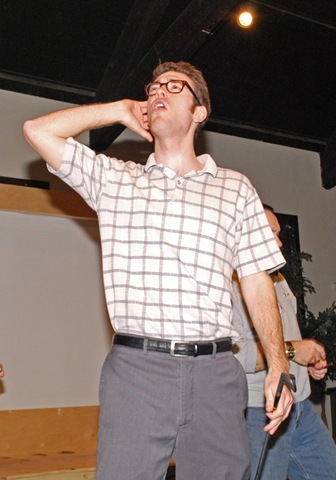 Almost all of the Act 1 musical numbers are just explanations of different elements of golf: terminology (“Talking The Talk”), lessons (“Really Very Easy”), scoring (“Gimme A Six”), things to say when someone has a bad shot (“Nice Shot”), new equipment (“New Shoe Soft Shoe”), and practice ranges (the terrible “Practice Range Rap”). The only song that offers any sort of insight into a real problem is “Why Can’t He See?”, Kathy’s solo after she scares Sam away by being too aggressive. And while the exchange before is so tame that the stakes aren’t really there when the song begins, credit to Powell for trying to tell an emotional story through song. 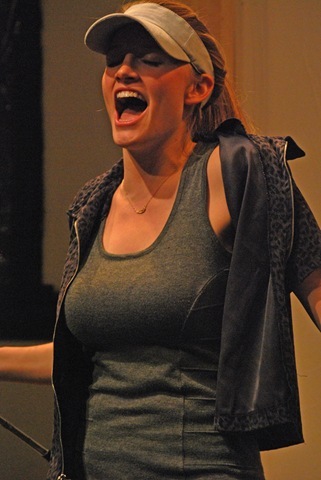 The same problems continue through Act 2, but the plot becomes even muddier with the introduction of Anika (Lovelace), a client for Sam’s firm that played golf in college. We are already supposed to be invested in a love triangle between Sam, Kathy, and Joan (despite having not even seen Sam and Joan in a scene together), and the addition of another character just weakens the already strained story. The plots aren’t very developed, so they are easily wrapped up, and the show comes to its predictable conclusion as the audience learns that “in the game of love and fairways, the best course is honesty.” The actors really do look like they’re having a great time while they perform, and much of the music is well sung, but it’s all so insubstantial that it’s hard to care. “Show, don’t tell” is a major problem in Fairways. The audience is told how the characters feel about each other rather than gaining these opinions through character interactions. People are constantly commenting about the relationship between Sam amd Joan, yet the only instance we see the two together is for their inevitable breakup. 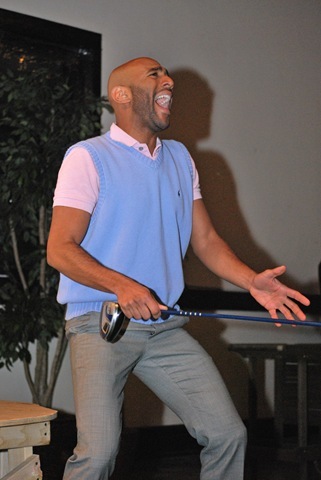 Or instead of showing how golf affects the characters on a personal level, the music just takes an element of the sport, and explains it through song. As an inaugural production, Fairways gives the impression that Endpoints is more concerned with getting the works of Artistic Director Curt Powell produced than creating works of strong musical theater. The script, music, and technical aspects of the show (some background images even contain huge watermarks from iStockPhoto) don’t match the quality of musicals with tickets nearly half the price, making Fairways a hard sell even for the most avid gold fan.